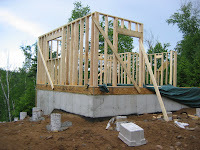 Over the weekend we were able to frame all but one side of the cottage. The following pictures illustrate various views of our progress as you move right to left or counterclockwise around the floor. Our progress is illustrated in the following pictures, starting with the east wall in the left picture. 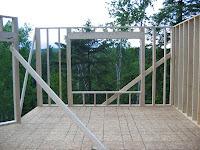 The east wall has the bathroom window. 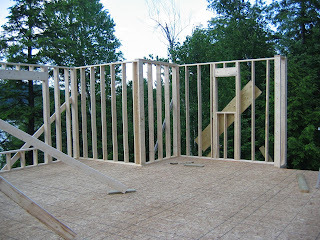 The wall next to the lakeside wall will have the wood stove. The lakeside wall with the large picture window. I posted a picture of the view it will provide in the previous post. This is the garden door which open up onto a big screened 12 x 12 octagonal deck with a gazebo like roof. 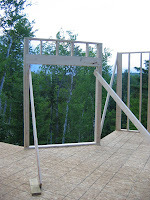 The garden door will be 6 feet in width, and open fully to expand the living space dramatically. I can't wait to be enjoying a cold one sitting in there! The rough opening for the kitchen window in the west wall. With large casement windows this will catch the westerly breezes and flow them through the cottage. Moving around the corner you can see the opening for the front door in the partially framed southern wall.